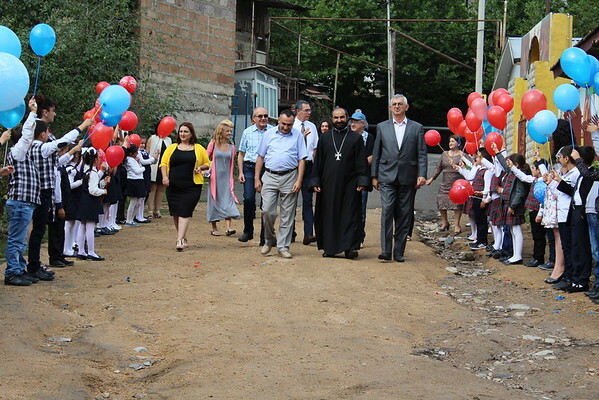 Thanks to our Breaking the Cycle of Poverty Program (BCPP), 10 schools in the Tavush Province’s Berd Region were able to start the new schools year with newly renovated facilities. Plenty of songs and dances accompanied the gratitude of parents and staff as Aygedzor Village celebrated the official opening of its completely renovated and newly furnished kindergarten. Thanks to BCPP’s support and input from the U.S. charity Focus on Children Now, the number of students this school year has increased by 10. Aygedzor’s kindergarten is already a beneficiary of BCPP’s malnutrition reduction component, which ensures all students receive free and nutritious meals at school, which contain the essential amount of daily vitamins and minerals. Also on September 6th, the Aygedzor School (which serves kids first grade and up) opened its newly renovated gym to its students, as did Berd School #3 and the Secondary School in Chinari Village, which both also now have new locker rooms. Schools in Tsaghkavan and Itsaqar Villages, as well as Berd College now have renovated or newly built open-air sportsgrounds. At the School of Movses, the rifle range room used for military training classes was renovated. Schools in Choratan and Verin Karmiraghbyur now have renovated and partially equipped cafeterias, which helps to support school administration responsible for providing lunch for the 46 and 60 students at each respective school. “In order to ensure proper mental and physical development of children not only it is important to have gyms but also food at school. Now we help provide the meals at kindergartens, while the cafeterias are here to help schools to better realize their meals program through improved conditions,” said Edik Karapetyan, FAR’s Education and Science Programs Manager. FAR also renovated or constructed the bathrooms in most of these 10 schools, too, just in time for the September opening. Launched in 2013, BCPP aims to strengthen the Berd Region of Tavush Province through poverty reduction via its education, health, social and economic development program components. One of the most important prospects of BCPP is investment into children today to ensure their better future. BCPP is sponsored by the Mardigian Family Foundation. Thanks to the education and health components of the 5-year, multi-component BCPP program, 30 schools and kindergartens have already received and continue to receive support.